Our ever popular Jack the Joker fundraiser continues this Sunday night in Alice O’Connor’s Bar where the jackpot is €8200 as on Sunday night Pat Earley was drawn out of the drum and chose card number 42 which when turned was not the joker but he did win €50. Ned and Yvonne Sheehan €25 each. As well as our group of ticket sellers tickets can be purchased from Village Flowers, Spar, Mousies Takeaway, Minnies Bar, Abbeyside Post Office and Crotty’s Bar. This Friday night our Senior Footballers get their Senior League campaign underway as they take on Dungarvan at 8pm in Dungarvan Club Grounds. Our last man standing fundraiser continued last weekend after which We have 233 people left out of the 714 who began on week one. We would like to thank all those who entered and a big thanks to Willow and Oak for their generous sponsorship. Our ever popular Jack the Joker fundraiser continues this Sunday night in Alice O’Connor’s Bar where the jackpot is €8000 as on Sunday night Teresa McGovern was drawn out of the drum and chose card number 35 which when turned was not the joker but she did win €50. Michael Scanlon and Kay O’Connor won €25 each. As well as our group of ticket sellers tickets can be purchased from Village Flowers, Spar, Mousies Takeaway, Minnies Bar, Abbeyside Post Office and Crotty’s Bar. Our ever popular Jack the Joker fundraiser continues this Sunday night in Alice O’Connor’s Bar where the jackpot is €7800 as on Sunday night Maurice O’Donnell was drawn out of the drum and chose card number 19 which when turned was not the joker but he did win €50. The Walsh family and Laura Cliffe won €25 each. As well as our group of ticket sellers tickets can be purchased from Village Flowers, Spar, Mousies Takeaway, Minnies Bar, Abbeyside Post Office and Crotty’s Bar. 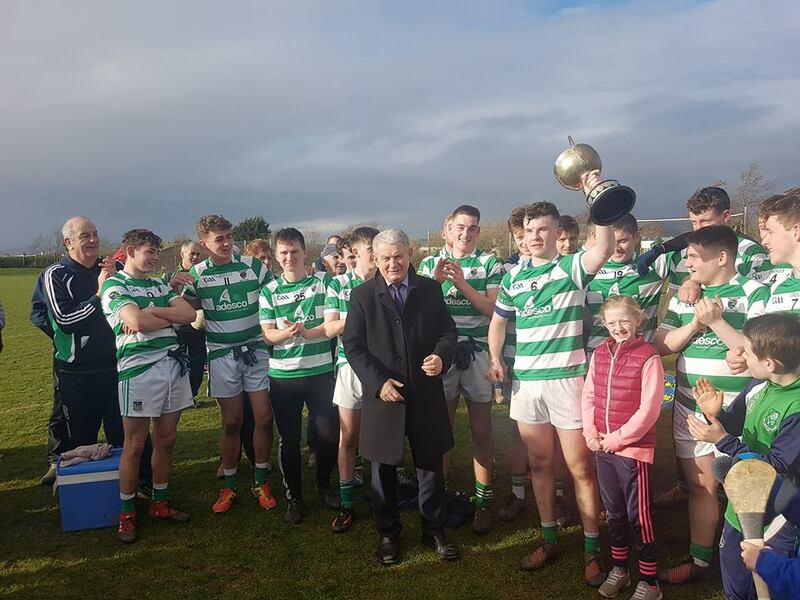 On Saturday afternoon last our Under 21 footballers claimed the club’s 11th County and our first since 2012 when they defeated a fine Gaultier side in the 2017 County Final in what turned out to be an excellent game of football. Played before a large attendance in the Gold Coast, the early stages of the game were evenly contested before a well taken goal just before half time gave us a half time lead of 5 points. The second half of the game was even more fiercely contested and credit to Gaultier they fought right to the full time whistle. There were great scenes of celebrations at the full time whistle and it was most fitting to have John Elsted captain the side to victory on a pitch in the heart of Ballinacourty. Indeed as many if our older members will know the Gold Coast pitch is almost next to the site of the old Elsteds pub which was the hub of the club for many years. We would like to thank all the players and management team involved with the lads for all the dedication and commitment they have shown over the last 12 months. They won’t have long to dwell on the victory though as the first round of the 2018 County Championship against Comeragh Gaels takes place in 4 weeks. TEAM: K. DWANE, C. DWYER, C. McCARTHY, J. DUGGAN, C. McCARTHY, J. ELSTED, D. McGRATH, J. BERESFORD, N. MONTGOMERY, T. LOOBY, D. LOOBY, S. WHELAN BARRETT, S. CLIFFE, S. DALY, E. KIELY. SUBS: D. MONTGOMERY, M. COLEMAN, M. TWOMEY. Our last man standing fundraiser continued last weekend and we say well done to this week's spot prize winner Julie Mulcahy who won the prize generously donated by Café Bliss. We would like to thank all those who entered and a big thanks to Willow and Oak for their generous sponsorship.